It’s no surprise that pet ownership can be expensive, though some would say the rewarding experience of having a cute and cuddly companion is priceless. However, it’s important to be realistic, as the cost of owning a pet is more than just the adoption or breeder fee and the expense of food. If you want to own a pet, you must be a responsible pet owner, which includes budgeting properly for your furry friend. If you’re looking for information about the cost of owning a pet you’ve come to the right place. 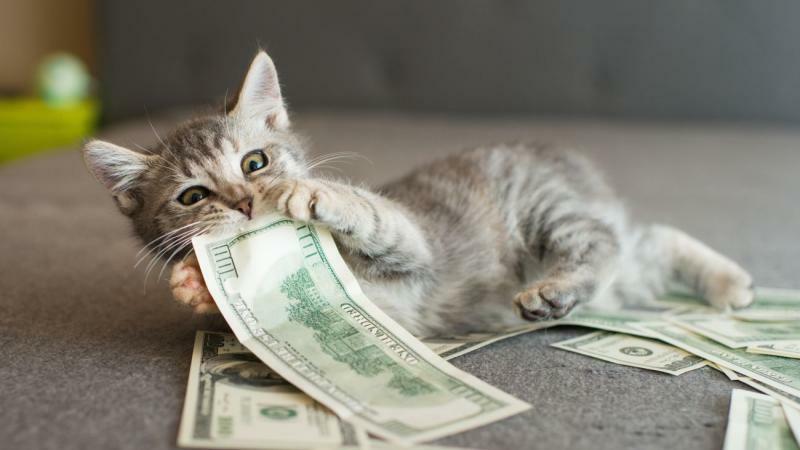 Today, we are going to break down all the expenses that come with pet ownership so you can make a responsible decision when it comes to owning a pet. According to the ASPCA, the cost of owning a small size dog in the first year alone is around an estimated $1,314, so you can just imagine what the cost for large size dog would be. With costs including food, toys, health insurance, pet license, and more, you’re looking at spending over $500 each additional year. This doesn’t include any emergency costs that may arise such as illness or injury, which could cost you thousands of dollars depending on the breed of the pet. To make it easier to think about the total cost of owning a pet, let’s break it down. When it comes to owning a pet, the first thing you’ll have to think about is whether you’re planning to adopt or purchase a dog from a breeder. Of course, if you decided to purchase a dog you can expect to spend anywhere from $500 to $2,000 depending on the breed. One of the best things you can do to keep the initial cost down is to consider adoption. Not only will it be good on the wallet, but it will make you feel good knowing that you helped a pet in need. According to Spruce Pets, adopting a pet from a shelter or rescue will cost anywhere from $50 to $200. Other initial costs include vaccinations, medications, and special treatments. You’ll most likely spend up to $300 for the first visit to the vet. Some of the monthly expenses in your budget will include food, toys, and grooming. Food will be one of the most expensive purchases as most pet owners opt for the more expensive and healthiest pet foods to ensure their furbaby is getting the nutrients they need. Therefore, plan to spend at least $60 a month on food. Another major expense that comes with pet ownership is preventative medical, emergency or any other unexpected expenses. Preventative medical treatment could include medications to prevent fleas, ticks, and heartworms. You’ll most likely spend anywhere between $100 and $500 on preventative medications alone. In addition, you’ll spend about $300 a year on routine veterinary care. However, there are some costs that you can’t predict but should be prepared for if they arise such as emergency care, chronic illness, injury, and any other unplanned emergency vet visit. You should always have an emergency fund set up for your pet or some sort of plan in place if an unexpected pet expense were to arise. Now that you understand the breakdown in costs, there are actually some ways to reduce your pet’s medical bill. It’s unlikely that you’ll find an organization that will pay for ongoing medical costs. Most organizations will help but only for a certain period of time. Be sure to contact multiple organizations, as it is unlikely that you’ll find an organization willing to cover the full costs. Look to get help from a variety of organizations as any amount of grants can add up. Most organizations will require you to submit an application through email or web forms. It’s important to spend time researching each organization before asking for aid. RedRover (formerly United Animal Nations) helps to provide temporary emergency shelter, resources, financial assistance, and emotional support when animals and people are in crisis. Some of the grants that RedRover hands out include Urgent Care Relief grants and Domestic Violence Safe Escape grants to help families with pets escape dangerous situations. The Pet Fund is a nonprofit organization that helps to fund veterinary care for those who cannot afford it. Their focus is on non-basic, non-emergency care. Paws 4 a Cure is another nonprofit organization that is run by an all-volunteer staff. They help to provide financial assistance to those who cannot afford veterinary care. There are plenty of organizations out there that are willing to help you cover the cost of expensive medical treatments for your pets. It’s important to do your own research when it comes to finding the right financial aid programs for your pets’ needs. In addition to financial aid programs, there are plenty of other ways you can save money as a pet owner. One interesting way that you can save money is by making your own pet toys. There are plenty of DIY tutorials online that can help you make a fun toy for your beloved furry friend. There is no need to overthink things since a toy can be as simple as tying an old shirt in a knot. Treats can be very expensive, one way to cut this cost is to make your own treats. This may require a bit more effort, but your wallet will be thanking you. Plus, there are plenty of recipes online on how to make healthy treats for your pet. Another way you can save money is by doing your pet’s grooming at home. If you’re not comfortable trimming your pet’s nails, maybe you can wash them instead. There are a couple of ways to save money at the vet. One way is asking for an estimate; remember you have the right to know exactly what you’re paying for. Another way is to do your homework. It’s important to know that each veterinary clinic sets its own prices. By doing some quick research, you can find the best and lowest priced clinic in your area. When you become a pet owner, you have to acknowledge that you’re taking on a huge responsibility as all pets deserve the same love and care as you would give a human being. If you run out of options in regards to your financial situation and realize that you can no longer afford to keep your pet, it’s important to know that you have options. Under no circumstance should any pet owner abandon their pet — it’s illegal. It is your responsibility to make sure your pet is cared for properly. Therefore, you are responsible for finding your pet a proper home or place to stay. There are many animal rescue groups that are willing to accept animals under certain circumstances. However, be prepared to pay a small fee. It’s also important to make sure that you have all your pet’s medical records and any other important paperwork like microchip information or breed papers. Giving up a pet is never easy. Before you give up your pet, it’s important to explore every option you have. And remember if you cannot find a home, foster arrangement, or rescue group that can take your pet, you may need to surrender your pet to the local public animal shelter or to animal control. You have options and abandonment is never one.